The City of Morro Bay incorporated July 17, 1964. Throughout 2014 a citizens’ committee plans to celebrate established events while developing some new activities. Posted updates are at www.morrobay50th. At the kick-off dinner in January several individuals and groups were recognized for decades of contributions. Taylor Newton at 35 the youngest to be recognized, might be considered representative of Morro Bay’s future. Club dues consist of members volunteering to provide labor, planting, maintenance, composting, and waste management at festivals and events. In exchange members qualify for housing, food, clothing, education and employment opportunities. GGC has created a demonstration garden with sustainable landscaping and a wholesale nursery at St.Timothy’s Catholic Church on Kennedy Way. The club contracts public and private landscaping projects and is developing an Urban Farming Facility. Contact them at http:/www.mbggc.blogspot.com or http://www.facebook.com/MorroBayGuerrillaGardeningClub. Newton is president and a founding member of Eco-Rotary. He was featured in the international Rotarian Magazine for his development of GGC and a zero-waste program that encourages many San Luis Obispo county festivals and events to use recycled materials. Members of GGC are contracted to complete clean-up, thus, creating zero-waste events. In June, Eco-Rotary will present a second Eco-Faire showcasing area sustainable products and businesses. Newton is a member of the Morro Bay Lions and serves on the Morro Bay Tree Committee and is growing 50+ trees to be planted in 2014 to beautify Morro Bay during the Morro Bay 50th celebration. He leads by example and gives and gives back to his community while his family-time with Jeni Randolf Taylor and the kids is golden. Note: Jeni is his rock with GGC and the family! 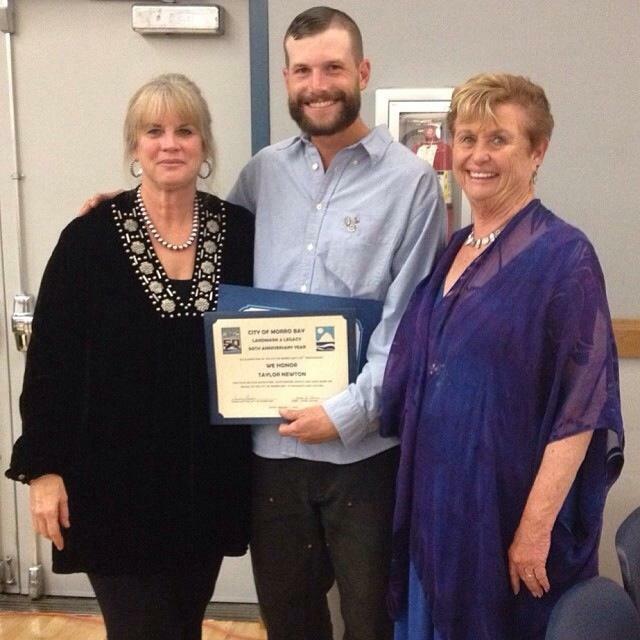 Pictures feature Taylor with former Councilwoman Carla Borchard and fellow Eco-Rotarian….and current Councilwoman Nancy Johnson…and Morro Bay Guerrilla Gardening Logo.